The First Full-Lenght Trailer for 'STAR WARS: THE FORCE AWAKENS' is Finally Here! Yes its finally here, the Trailer made it's TV debut during ESPN's telecast of Monday Night Football sounding & looking amazing with plenty of raised questions to boot! Star Wars: The Force Awakens is set 30 years after the events of Return of the Jedi, & features a new generation of swashbuckling heroes & shadowy villains, as well as the return of fan-favorite smugglers, princesses, & Jedi. Directed by J.J. Abrams, the highly-anticipated movie stars Harrison Ford, Mark Hamill, Carrie Fisher, Adam Driver, Daisy Ridley, John Boyega, Oscar Isaac, Lupita Nyong’o, Andy Serkis, Domhnall Gleeson, Anthony Daniels, Peter Mayhew & Max Von Sydow. Star Wars: The Force Awakens will be followed on December 16, 2016 by Rogue One: A Star Wars Story, Star Wars: Episode VIII on May 26, 2017, and the Han Solo anthology movie on May 25, 2018. Hit the jump to check out the trailer. 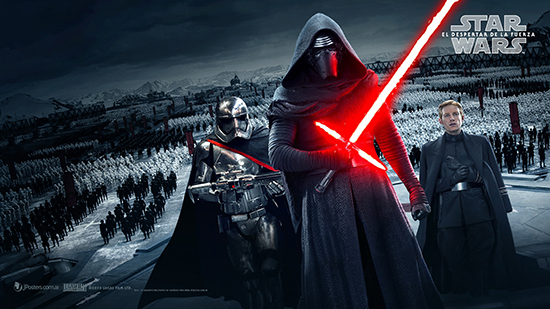 I'm reading: The First Full-Lenght Trailer for 'STAR WARS: THE FORCE AWAKENS' is Finally Here!Tweet this!